Stewartry returned to sunny Greenlaw hoping to win at home for a third time. 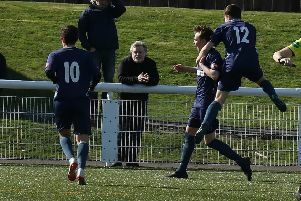 Coach John Muir decided to watch the game as he had a full squad available and see where the problems might lie after two away defeats in a row. Clydebank kicked off in front of a good sized crowd and both their first two attacks were repelled by the boot of John Fingland back to their 22. Clydebank were proving to be a tough nut to crack and both teams were giving away numerous penalties or the ball was being lost in the tackle. The game flowed back and forward with both defences doing their jobs. Porteous was stopped on the Clydebank line before Clydebank took the game back to the other end and a penalty award was converted to open the scoring. Clydebank kept the pressure on for ten minutes before Scott Milligan broke down the right wing and cut into the posts where a penalty was won. Craig Mosey converted the kick. Stewartry were now putting pressure on the Clydebank line being stopped on four occasions before a penalty kick again from Mosey put the Blacks 6-3 ahead at half time. The second half saw a different Stewartry team after words from the coach they repelled early Clydebank pressure and McCulloch was supreme in the lineout allowing Robert Austin the chance to break through with Carson and back to Austin for the first try. Mosey converted. Next it was Mosey, Kerr and Taylor breaking to the corner resulting in a scrum which gave Porteous the chance to touch down for a second try. Mosey converted again. On the hour a charging run from prop Broll gave scrum half Jamie Farquhar the chance to jump over the resulting melee for the third score. Mosey converted. 27-3 ahead Stewartry eased off and Clydebank soon took advantage driving from half way with some good interplay between backs and forwards to score out at the left hand corner. The conversion from the touchline soared over the bar. Martin Smith was unlucky not to score when he broke from halfway being knocked into touch. He was rewarded minutes later with a push over try for the fourth bonus point try. Craig Mosey completed the scoring with his sixth successful kick off the game. A stuttering first half performance was soon forgotten about with a bonus point second half performance and back up to second place in the league.